Are you a local-DFW, art enthusiast? Have you ever wanted to transform a vehicle with an original, artistic design? Well here’s your chance. Let your imagination run wild! 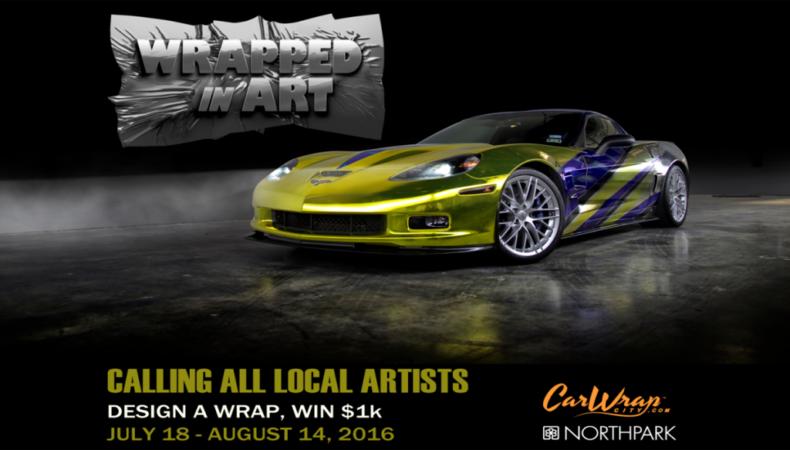 Car Wrap City™, Texas’ premier vehicle wrap company, is proud to announce its first annual “Wrapped in Art” Competition, with title sponsor NorthPark Center. The local art competition aims to showcase the creativity and artistic talents of Dallas-Fort Worth residents of all ages. Between July 18 and August 14, 2016, interested participants may submit an original car wrap design in the form of a drawing, painting or digital image. Five finalists will be showcased from August 20 through 27, 2016, at NorthPark Center during the NorthPark Auto Show, and on the Car Wrap City Facebook page. Visitors will be invited to visit the Center and the Car Wrap City page to vote for the winner based on number of likes. Following the NorthPark Auto Show, the winner of the competition will be awarded with a $1,000 cash prize, or a complimentary car wrap (up to $2,500 value). The first place winner, judged based on overall design, skill and theme creativity using the templates provided online, will be awarded a $1,000 cash prize or a free car wrap (up to $2,500 value). Based on age and overall wow-factor, the winner will have the chance to be interviewed for a professional graphic designer position with the Car Wrap City team. A first runner-up prize of $250 will be awarded for overall creativity. Interested artists are encouraged to submit an original car wrap design in the form of a drawing, painting or digital image, using the provided templates on CarWrapCity.com/Contest. Creativity is encouraged. All artwork will be submitted electronically on Car Wrap City’s website, via email at WrappedInArt@boltpr.com, or via mail at 501 Elm St., Suite 450, Dallas, TX 75202. For full contest rules, visit www.CarWrapCity.com/Contest. For general contest questions, email carwrapcity@boltpr.com. Founded in 2004, Car Wrap City is Texas’ premier vehicle wrap company with professional graphic artists and experienced, certified installers. Car Wrap City is reinventing the car wrapping industry by providing the highest quality car wraps in the industry, never cutting corners and not stopping until the job is done right. Specializing in the design, printing, and installation of car wraps, Car Wrap City can wrap anything that will stand still long enough. To learn more about Car Wrap City, and its services, or to learn more about the campaign, visit carwrapcity.com or call (877) 81-WRAPS. For Car Wrap City’s Facebook profile, visitwww.facebook.com/carwrapcity, and Instagram profile, visitinstagram.com/carwrapcity/.